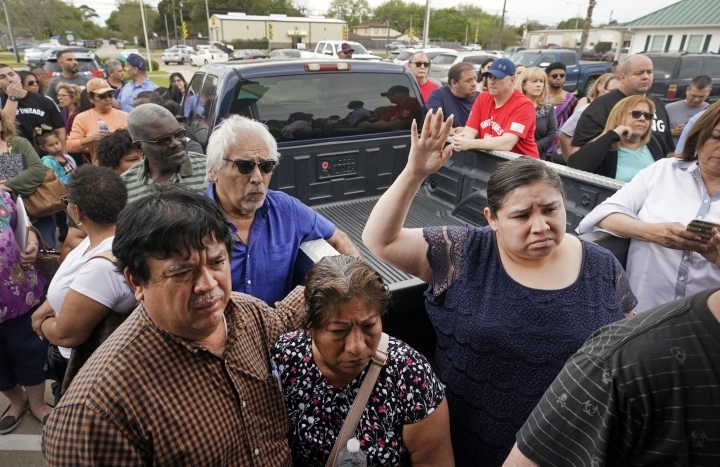 HOUSTON — Businesses and residents expressed concern Monday about the environmental and economic fallout from a fire at a Houston-area petrochemical storage farm that sent huge plumes into the air for days and prompted the partial closure of one of the busiest commercial waterways in the U.S.
Officials said it could be several more days before a section of the Houston Ship Channel reopens. 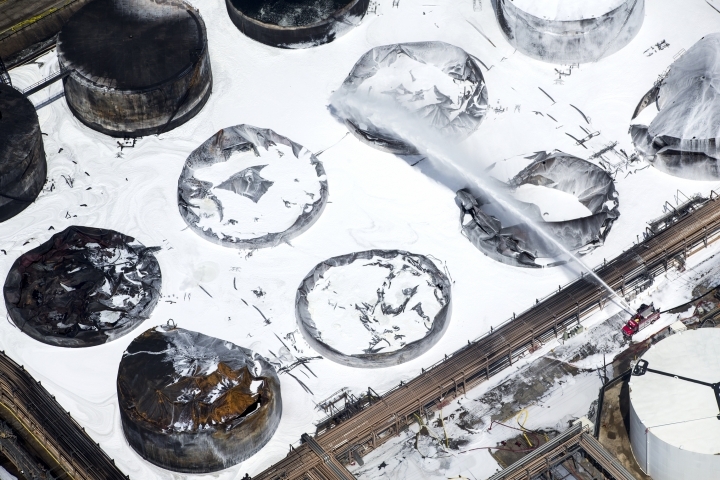 Investigators with Harris County, which includes Houston, said they have delivered a subpoena to Intercontinental Terminals Company — the firm that owns the facility — to preserve any evidence regarding the cause of the blaze. Students returned to class after the fire prompted school closures near the facility. A massive fire started March 17 at the ITC plant in the suburb of Deer Park, southeast of Houston. It left several petrochemical tanks damaged or destroyed and thrust plumes of black smoke into the air and burned on and off for days. It's unclear how the blaze began. On Thursday, residents were warned to stay inside for their own safety because of high levels of benzene in the air. The chemical evaporates quickly and can cause drowsiness, dizziness, rapid heartbeat, and headaches, with worse symptoms at higher levels of exposure. Some of ITC's tanks leaked oil products and a containment area was breached Friday, leading to the mixture reaching the ship channel, said company spokesman Brent Weber. Authorities shut down part of the ship channel Friday to traffic to try and continue the cleanup and contain the spill. U.S. Coast Guard Capt. Kevin Oditt said Monday it could be several more days before that part of the channel reopens. "The priorities remain ensuring the safety of our on-scene responders as well as mitigating any impact to the waterway or the environment and reopening the Houston Ship Channel," Oditt said. 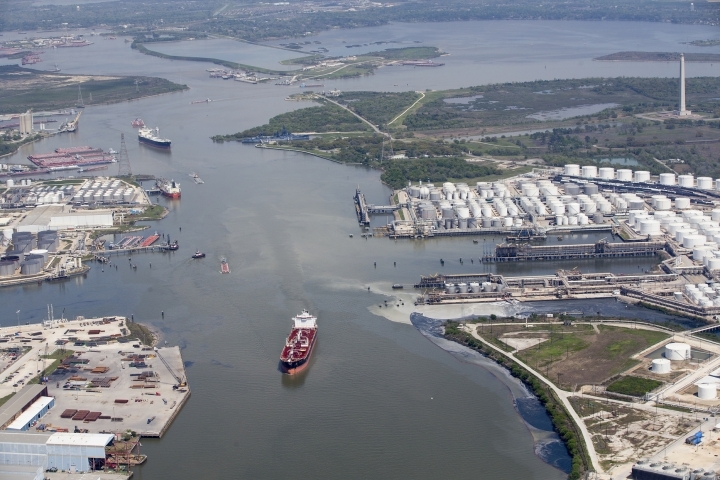 The San Jacinto River, a waterway leading into the ship channel and located north of ITC's facility, was reopened to barge and tow traffic but only for about three hours on Monday. Oditt said officials have performed several test runs with ships, letting them pass through the affected area to see if they don't interfere with the cleanup and don't get contaminated. Such test runs will help the Coast Guard determine when the channel can be fully opened. The Port of Houston is the No. 1 in the U.S. in foreign tonnage and is in the top five in the U.S. in the number of containers it handles. The head of a maritime trade organization representing more than 200 companies at the port said the closure of several miles of the channel has slowed but not stalled commerce. The top products that pass through the ship channel include resins and plastics, chemicals, fabrics, including raw cotton, and steel and metals. Capt. Bill Diehl, president of the Greater Houston Port Bureau, said Monday the port is a manufacturing center for petrochemicals and supporting businesses and that those places are still operating but that products may be slow to come in or out right now. Diehl said the channel is 52 miles long and other sections have remained open. As of Monday afternoon, some ships were being slowly taken through the area that had been closed to make sure they didn't disturb the cleanup. That section, for now, is only open to daylight transits, Diehl said. "It has an effect on business," Diehl said, "but not as much as you'd think." Diehl said that half of the ships that come into Texas come through the Port of Houston. He said on average they move 55 ships a day. ITC is facing legal challenges over the fire and spill. On Monday, seven people who live near the storage facility filed what is believed to be the first civil lawsuit against ITC over the fire. The suit was filed in state district court in Houston. The residents are asking for at least $1 million in damages, accusing ITC of negligence. They allege they suffered a variety of illnesses due to the fire and the release of chemicals into the air, including, bronchitis, pneumonia and itchy, burning eyes. Texas Attorney General Ken Paxton filed a lawsuit against ITC on Friday and said the state must hold the company "accountable for the damage it has done to our environment." State and other environmental watch dogs also are continuing to test water and air. 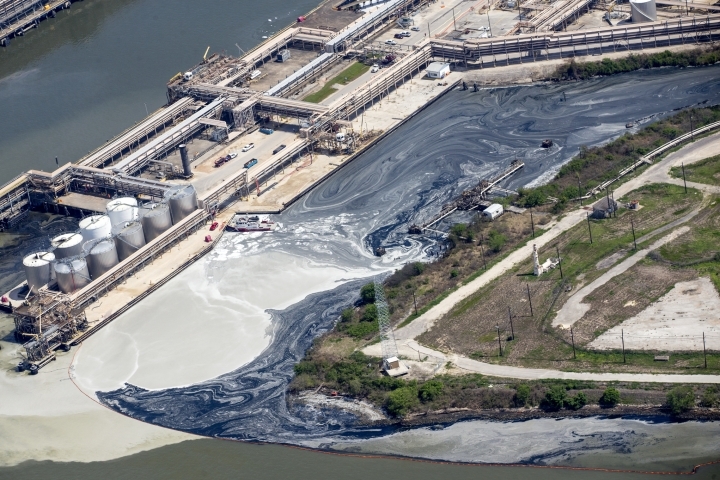 Water samples from the Houston Ship Channel have been tested, but those results were still not complete Monday, said Jeff Kunze, with the Texas Commission on Environmental Quality. Over the weekend, benzene levels in the air were very high near the site of the fire, but dropped significantly, according to monitoring by the Environmental Defense Fund. Tests by the nonprofit the Galveston Bay Foundation over a four-day period starting Friday found benzene in 14 water samples taken from the Houston Ship Channel. But only one sample, from Saturday, had levels of benzene considered to be unsafe by the U.S. Environmental Protection Agency. By Monday, all samples tested were at safe levels, according to the foundation. Adam Adams, the federal onsite coordinator with the EPA, said Monday that air monitoring from his agency as well as several others in the last 24 hours had not found any hazardous conditions that would require warning the public. "That's very positive," Adams said. Associated Press writers Jamie Stengle in Dallas and Tammy Webber in Chicago contributed to this report.